Sangeet Bhullar is executive director of WISE KIDS, which promotes innovative, positive and safe Internet use. In this contribution to our exploration, Sangeet emphasis the importance of going beyond digital literacy towards digital citizenship – both for young people and those who seek to support them. As has been mentioned before youth are not a homogenous group, and therefore, one of the first things I would say is we need to understand where young people are at – listening to them, understanding their motivations and behaviour, their particular ‘youth culture’. This varies according to many factors including age, regions, socio-economic status etc. Digital literacy means learning how to work the information and communication technologies in a networked environment, as well as understanding the social, cultural and ethical issues that go along with the use of these technologies. Media literacy is the ability to access, analyse, evaluate, create, reflect upon, and act with the information products that media disseminate. The Knight Commission have identified digital and media literacy as essential for democracy and civic engagement and believe that successful participation in the digital age entails two kinds of skills sets – digital literacy and media literacy. Those seeking to engage youth with digital technologies would also do well to help young people develop a culture of digital citizenship as defined by the ISTE (and the social, emotional, leadership and digital competencies associated with these). From my own work in this area, I feel that digital literacy skills, which should focus on the creative and effective use of digital technologies, also need to explore the topics of ethics, responsible use, appropriate boundaries, privacy and legal issues. Whilst many people think that young people are fairly competent in their use of digital technologies, there are still gaps in this knowledge, which if addressed, could help them use them more effectively. In the broader sense of digital literacy, we should also be helping young people explore the way changing digital and web technologies are affecting society, culture, politics and more, and mediating the development of skills and competencies to help them develop their own sense of this digital space, and their place in it. This means that those who seek to engage youth with digital technologies need to develop their own digital literacy skills and develop a good understanding of how businesses and individuals are using digital and web technologies for benefit (or not). It would also be good if they could showcase examples of where youth are already using the web and digital technologies for advocacy, personal and community benefit and developing a positive online presence. I’m half way through writing up a provocation paper for Nominet Trust based on the project David Wilcox, Alex Farrow and I have been working on to explore key messages on how digital technologies can support young people to engage socially and economically with their communities. You can find the latest blog posts from the project here. We started the process with an open online document that generated over 30 suggested messages, both on the How To of using digital technology, and the issues to think about when engaging 16 – 24 year olds. We took the messages into a workshop with 30 young and older digital innovators in London, and came out with 10 prioritised messages. Driven by the idea of ‘social reporting’ as a process of bringing together and curating content that has already been generated, we then set out to find existing online material that could be used to expand on those key messages, and Alex Farrow has been working hard to put together 10 ‘storify’ posts (see below) that capture and curate key content – both gathered through the online document, tweeting and the workshop, and from going out and searching the web for relevant academic research and social media snippets. The goal was for these storify posts both inform the write-up of a short paper summarising the messages, and for them to act as an extra resource that could ‘show not tell’ those interested in the messages what the mean. For example, it’s pretty hard to capture what co-design is in 300 words of prose, but in a couple of short video clips, photo-rich blog posts, and pithy tweets, it should be possible to communicate a more rounded picture. Alex Farrow has been hard at work curating content, and we’re getting close to that goal, although it’s turned out more challenging than we expected to track down snappy online content to illuminate the key messages*. So – we’re really after your help to really make sense what it means to blend online and offline in supporting young people, or to use games to engage (or any of the other messages below). Tweet us additional examples, quotes, links or comments using #DTYE or to @alexjamesfarrow, @timdavies or @davidwilcox. We’re particularly keen on good short video clips or slideshows that help make sense of the messages. Good tweets might be used directly in the storify posts, so clear and concise summaries of ideas very welcome. Using the comment box below each Storify post, give any feedback, comments, thoughts on the blog. Whilst the final draft of the provocations paper that Nominet Trust will be printing up will be completed in the next week or so, we’ll keep adding to the storify posts, which will be linked to from the paper, so ongoing input and ideas are really welcome. What challenges are young people facing in the UK today? At our workshop event in April 2012 we sought to dig behind the headline challenges to understand the underlying issues that social innovators might be able to address. Digital and online innovations don’t only have to be delivered online. Online tools can support local community building and action – and projects should plan to work both on the web, and in local or face-to-face settings. Adding an element of gaming to your project can provide the incentives for young people to get engaged. Collecting points, completing challenges and competing with others can all spur young people on to get involved and stay involved. Not all digital innovations have to be about directly using technology with young people. Putting better tools in the hands of frontline workers, and intermediaries who work with young people can create the biggest benefit. Digital technology can enable young people to be content creators: “youth can learn video making, digital engagement etc. – and if it aims to be social and community focused – imagine the possibilities!”. Many youth don’t take advantage of digital opportunities for creativity – and action to support them to do so is important. From creating multimedia content, to providing feedback on the good and the bad – young people can be involved in shaping digital resources developed to support them. The only way to create services for young people, is in collaboration with young people. User-centred design, agile and iterative design methods all provide ways for young people to be involved through the process of creating innovative solutions. Digital technology is not just about easier ways to find a job: it changes the nature of work. Home working, portfolio working, freelancing and co-operative business structures are all enabled by the Internet. Better CVs and job information won’t solve the unemployment crisis: we need to use digital technologies to create and support new ways of working and making a living. In the Internet age education doesn’t have to be top-down, digital tools allow for peer-to-peer learning: helping people come together to teach, learn and collaborate. Digital technologies can be used to aggregate content from multiple sources, and customise an individuals experience of online information. Young people out of work or education are not a homogeneous group: and have many different needs. Although young people might be using online social networks like Facebook all the time, the connections they have to inspiration, role models and opportunities for volunteering, education or employment can be limited. Think about how digital tools can help you to map out networks, and to make new connections that broaden the horizons and increase the resources accessible to young people. Who are the young people? Although there are many similarities across the 16-24 age group, there are also some key differences in how they use technology. The Design Council in partnership with Nominet Trust have just launched the Working Well Design Challenge. Designers and youth organisations are being invited to join forces to design, build and launch new digital products and services that help young people develop their talents and earn a living. Two of their team joined us at our DYTE workshop and we’re really excited to see some of the themes from the day reflected in the challenge call for entries. Here Mike Smart explains more about the Challenge, and below Dan Sutch explains how Nominet Trust is developing its wider range of investments, informed in part by our exploration here. With record numbers of 16-24 year olds not in education, employment or training, there is a serious need to improve how we support young people to achieve their goals. Unfortunately, jargon such as ‘NEET’ not only does many a disservice, but presents the situation as a problem of economic policy rather than an opportunity to do something practical to help. Design Challenges bring designers, manufacturers and technologists together to demonstrate how design can turn challenges into opportunities. In this instance, we’re offering three teams £50,000 each to design, build and launch digital products and services that offer young people new opportunities to participate in society, both economically and socially. We’re thrilled to have partnered with Nominet Trust to run this challenge. No young person should be forced into a bad job, unpaid work experience or unemployment, whether because of the current economic climate or a poor start in life. I’m especially excited that this challenge allows us to bring together the power of technology to challenge and disrupt existing ways of working, with the ability of designers to make products and services useful, useable and desirable. We all know that digital technology has revolutionised the way we discover and act on opportunities – everything from finding our way around to keeping in touch has been radically altered by the internet. However, if it wasn’t for designers making that technology simple and easy to use, the digital revolution would never have happened. Working Well follows on from a number of previous Design Challenges. Recently, our Living Well With Dementia challenge recently resulted in five innovative products and services that have been critically acclaimed by dementia specialists and the design community. In the past we’ve also tackled violence and aggression in A&E departments, improving patient privacy and dignity, and reducing health care associated infections in wards. This is an exciting opportunity for designers and youth organisations to really make a difference to the lives of young people in the UK. We’re looking to hear from people with expertise either in design and technology or working with young people. So if this sounds like you, then download the call for entries through our website and apply before the 20th June 2012. Nominet Trust is developing a programme of social investment to address the challenges faced by young people in participating socially and economically with their communities. This grants and investment programme will seek to support new approaches to using digital technology to re-design ways of supporting young people. As part of this, the Trust is working with a range of partners to identify the most significant challenges as well as exploring a range of approaches to using digital technology. Through research and co-design; partnerships and project funding; evaluation and reflection, these key challenges will be refined and developed as we seek to ensure this programme creates the greatest value in addressing these social challenges. Working Well a partnership with the Design Council; Digital Makers in partnership with NESTA and Digital Edge all contribute to this programme with a shared goal of better supporting young people to engage socially and economically with their communities through the use of digital technologies. More details of each partnership and the challenges they’re seeking to address will be available soon at www.nominettrust.org.uk. We’re looking for partners and ideas to address these challenges, and look forward to working with you to do so. Charlotte Tizzard, Big Lottery Fund web editor, provides an update below on the co-design process with young people that we reported earlier. Charlotte asked young people for their views – and in the video Dharmendra Kanani, England Director, and some of the team also talk about the process. Their insights are going to be really useful in our wider exploration of young people and digital engagement. In January 2012, the Big Lottery Fund began the process of recruiting twenty 16-25 year olds to work with them on designing their next investment in young people. This sort of engagement reflects our desire to ensure that our investments in England are informed by what we call People Powered Change. As the digital bod in the team, I was excited about the prospect of using social media to reach a new audience for BIG and get young people from all over England sharing their views, issues and solutions. With BIG’s already strong Facebook and Twitter followings, it felt like an easy enough task to engage a few hundred extra people. Five months later, the young people have come up with their initial priorities for funding and are now helping us launch our first new investments. Social media and other technology have been an integral part of the process, and along the way we’ve learned a lot about what works, and more vitally, what doesn’t, when using tech to engage young people. February was fast approaching, and a week before the deadline we had received only a handful of applications from young people wanting to take part. We had already emailed all our contacts working with young people, so we decided to Tweet and Facebook the opportunity out to the world from BIG’s main accounts. One week, 80 applications and a very satisfying Google Analytics graph later, we realised the power that lay in the networks of organisations and individuals who were connected to us online, many of whom we had never met or even heard of. As we felt social media was so important, we decided to have a dedicated social media team within the group, working alongside those young people responsible for analysing and discussing priorities for the investment and those working on evidence and learning within the process. So a group of seven young people were chosen, based on their interests and experience, to lead the social media effort. Following an initial get-together and planning session, this team worked virtually, keeping in touch with the other teams via phone calls and a closed Facebook group. One of the wider team recently described the social media campaign as “the powertool pushing our agenda forward,” but how successful has it really been? I spoke to Craig Blake, 20, from Essex, a member of the social media team, about how he felt the campaign had gone. Overall, I feel that the social media campaign has been a very big success. We have managed to outreach more than we first anticipated. A large percentage of young people use these sites on a regular basis, so it has been a free, efficient way to market the process to other young people. The group’s initial brief was to share what we were doing and collect views and opinions from young people and youth organisations about the biggest issues they faced. This was quite a broad message, but Craig and the team were able to ensure it was targeted by using their existing networks and fan bases. This allowed us to keep the campaign small-scale and precise, saving us time and effort and avoiding irrelevant requests. Although the team didn’t receive the volume of responses they had expected, some deep and insightful evidence was gained through conversations with other users, and over 100 young people responded to a SurveyMonkey designed by some of the team. Reanna, 21, from Manchester, also a member of the social media team, volunteered to blog on behalf of the group. This involved her coming to more face-to-face meetings with the team analysing the evidence collected and coming up with priorities. I’ve used social media to support this process by blogging about what the team has been doing to try and make it more accessible for young people to read. I’ve learned a lot about blogging – how to take a back seat, listen to people and write it up in a way which is accessible to everyone. I found it challenging as I didn’t quite realise how much time it would take! Reanna’s blog has been great in allowing the team to give their own perspective, while utilising BIG’s wide audience to shout about the significance of this process. The posts have received some lovely comments and been viewed by hundreds of people. A very daunting prospect from the start was that we were from all over the country – to communicate with all those people from different places in an efficient way felt like it would be difficult. That’s where the Facebook group has been great. I’ve been able to say, ‘I’ve got this meeting, what questions should I ask?’ Having feedback and new ideas on this from people has been amazing. I’ve had a place I can go if I need help with something. It’s really helped promote the fact that we are spread out all over the country yet working tightly as a team. Having the group has been a really critical part of the project. I didn’t have email addresses for everyone, but we were all on Facebook, even the staff. We’re all on there anyway, and the group focused on what we’re doing helped a lot. You can post more views with the public one and have other young people sharing their issues and how it affects them, and their ideas for solutions. You get such a wide variety of good and bad views. There was a lot of internet research going on and when team members found great articles, case studies and evidence, they found it so easy to post them online for others to see and comment on. However, the group was used more by some than others, and one of the young people believes this is partly due to the feeling of being ‘watched’. Some people have been really active on it which has been really helpful and encouraging. But some conversations haven’t gone on there as we know the team is watching – it hasn’t been as honest and open as it could be. For some members of the team, seeing information shared on the group led to frustration and a feeling that they were out of the loop. They had not all been at the same meetings and had not been filled in individually, making it harder to ask questions. The fact that social media conversation is often very one way was highlighted by Craig as a limitation of the outreach campaign. I feel that we could have got more views from young people if we had the chance to physically intercept them at events or projects. Social Media could have complemented this. By attending events we would have been able to get views from young people face-to-face. This would have allowed us to ask challenging questions to people on an individual basis and enable us to tailor the questions so that we get the best possible answers. The opinions collected from the hundreds of young people the group spoke to formed a vital part of their evidence base. Perhaps a more focused effort on meeting with young people in wider range of real-life settings may have benefitted the breadth of evidence and engagement the group achieved. It’s individuality of conversation that social media lacks. I can read your Facebook status, but I know you are talking to the world. I have to proactively choose to hear myself addressed and respond, and that’s quite a big step for any individual. It was through the whole-team face-to-face meetings that we were able to communicate to the young people the value we placed on their work, and that they were able to tell us frankly what they thought of how we were running the process and how we could improve it. Confidence and the fear of ‘saying something wrong’ seem to be a barrier to young people engaging via social media. We have seen much wider use of the closed group than the public page, which indicates that even our team, who are never shy to say what they’re thinking, might not be so confident sharing their views online. I found it hard at first as I’m not very good at computers. But over the past few weeks it’s been really good to get involved and see other people post things. It’s been really good to see what’s going on in different areas. This process could be improved by getting more young people who are affected firsthand by the themes we have chosen – for example unemployment – to come in and have input. It would be great to hear directly from a wider range of young people. This is what BIG plans to do as we move forward with our investment plans. It’s a great way to interview people in a way that allows them to really express their opinions in an informal 21st century way. Check out our YouTube channel to see some of the videos we have produced from Miituu footage. Miituu has also allowed us to map the journey of the team, which will be extremely useful in evaluating this process. As we move into the summer and more consultation meetings, presentations to the BIG England Committee and national launches, we will be providing further training to help the team use their social media and online skills to promote the products of this intense but brilliant process to the media. We’re expecting to learn a whole lot more too! Keep an eye on our Facebook page, Twitter feed and the big blog for more. One of the interesting side discussions sparked at the workshop we ran last week – on how community enablers can use digital tools – was with Eileen Conn, who has developed a very illuminating model of how local residents, groups and agencies interact. Eileen is a little unusual in being a community activist, in south London, who also worked for many years in Government. Eileen suggests we should consider the distinction in physics between matter and energy waves – where organisations with staff are the matter, and informal groups are more like energy. 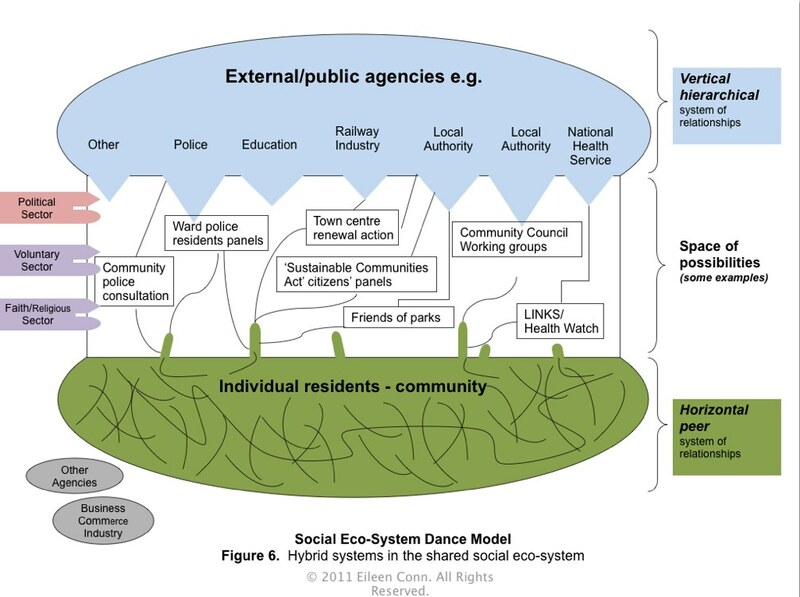 Drawing on complexity theory, Eileen suggests thinking about a “social eco-system dance” in which some relationships are primarily vertical hierarchical, and others horizontal peer-to-peer. That may be more useful than bottom-up and top-down. The problem is that community development workers may be co-opted into the hierarachy – a charge made by Nick Massey of Forever Manchester, who I reported here … which led to further discussion and rebuttal here. Anyway, the issue surfaced again last week when, as part of the workshop, we invented some local community enablers. That was a generic term I used to cover the various types of community organisers, builders and development workers increasing operating in neighbourhoods. Background here on different models. One group invented enablers who were “home grown” – that is, they emerged from the local community rather then being part of an external intervention. Eileen makes the point in this interview, after the workshop, that in developing models for community enabling we should pay attention to this emergence. As I reported in my earlier post about the workshop, there’s a bit difference between the development of action in an area that emerges naturally over time, and that which may be accelerated/imposed by external interventions. Anyone who is being paid will have targets and timetables to meet. This may be also be important when we consider the role of digital media. As Eileen remarks towards the end of the interview, once we came to that part of the process in the workshop there was a tendency to throw in all sorts of tools … even though we had spent a lot of time focussing on the need to be clear about the tasks, and the preferences and capabilities of those involved. Perhaps thinking about media ecologies in relation to the social eco-system will be helpful. There’s an interesting blog on that here. Our exploration into the skills, roles, and approaches of community enablers – and how they can use digital tools for network building and neighbourhood change – took a big jump forward last week with a workshop of some 20 people to play through these issues in the fictitious town of Slapham. Local community organiser Mark Parker hosted our event at the recently-rebuilt Cambridge House in Southwark (a terrific venue), and my colleague Drew Mackie tweaked the Slapham game that we first developed for Community Matters, and then used in a workshop with the Forever Manchester Community Builders. Over five hours we developed stories about what was happening in the four neighbourhoods of Golson, Tarley, Blaybeck and Stobben – and how the community enablers Beatice, Dave, Hawa, Matt and others were helping citizens collaborate to tackle the challenges there, using a mix of methods. This is a first report with the material we generated, to allow participants to add their thoughts if they wish. I’ll do more detailed analysis later. I started off with a short presentation using some of these slides from the Manchester workshop, including the one above. 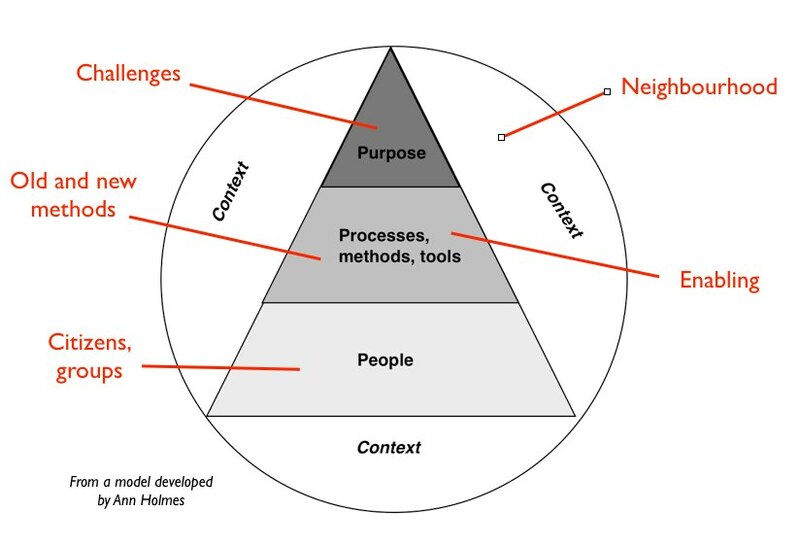 The main point is that in any situation it is best to consider the context, the purpose you are trying to achieve, the people who will be involved, and only then the nature of the processes and methods that may enable action. Otherwise you may jump to the latest shiny tool. We describe the process in detail in the book Social by Social. We split into four groups, each taking one of the neighbourhoods on the map below. Scroll down for neighbourhood descriptions. First, groups read the scenario and added extra material to their adopted neighbourhood, including the assets and issues. They then passed this extend scenario to the next group – who inherited the challenges. The groups then took the neighbourhoods that were passed to them and created two characters: community enablers who would help local people address the issues. We asked for names, a cartoon if possible, history, skills, character traits and a summary of what they were trying to achieve. Thirdly, the groups examined a set of cards with tech tools and chose those that the community enablers might use. These were the same as the cards we used in Manchester, coded for personal, group and public use, and rated as basic, intermediate and advanced. I asked each group to do a short presentation about their area and enablers, and also captured reporting back on the technology plans. Apologies for the quality of the video in the Stobben tech report back – glare whited it out. I have created a gallery of all flip charts as well. Several groups invented enablers who had lived in the area … and their approach could be quite different from those were introduced from outside. There’s a bit difference between the development of action in an area that emerges naturally over time, and that which may be accelerated/imposed by external interventions. Anyone who is being paid will have targets and timetables to meet. Technology can increase the divide between initiatives in a community, because of the different levels of access and skills people have. It is important to use a mix of communication methods, and also to aim to join up the online and face-to-face networks that evolve. The people who are active online are not necessarily those who are active in local projects, and vice-versa. Technology should be used to complement and enhance community activity, not drive it. There’s a danger that those who are familiar with tech tools will push forward with their favourites. However, technology can substantially speed up developments, if used appropriately. We should not believe that young people who may be using Facebook personally will favour that for group use. They are as likely to use Blackberry Messenger for that. On reflection, we should have offered groups a wider range of both tech and non-tech methods – as we have done in other games. By only offering tech solutions we distorted the plans. While groups were highly creative in developing tech-enhanced plans, covering one or two years, these were probably unrealistic in practice. Several people made the point that you won’t know what methods to use in the longer-term until you have got started. In practice the way that tech tool are used will be highly specific to any situation, enabler and local people … and we need to do far more to explore that complexity in practice. Overall I think the session worked well – but I’m keen to get more comments from participants! People generally said it was a lot of fun, a chance to meet new people with similar interests, and a creative way to explore the issues. The community enabler characters were great … and will find their way into the next version of the Slapham scenario. Drew and I are developing Slapham as a virtual lab for a range of games. We’ll be talking with Mark and others about the potential for a further large event. Meanwhile, if you wish to run a session yourself do feel free to download the material and go ahead. If you get in touch, Drew and I will be glad to provide some additional guidance … or come and run it with you if you have some budget. Finally, a big thank you to Mark and Cambridge House for hosting, and to everyone who came and contributed so much on the day. Social by Social game – an earlier version of our social media game. More games here. Update 2: since 2012 Slapham has become Slipham. 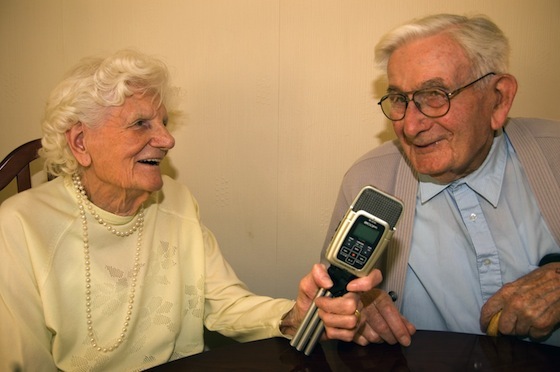 You can see here how it as used in May 2016 to explore the role of community connectors in helping older people find services and opportunities in their community. And Cormac has a graphic and memorable way with words: For example about the importance of social justice and welcoming in “the stranger at the edge”. Similarly the idea of paid and unpaid community development workers offering a “halo of support”. So far so anodyne. Interesting too, is the contention – which I agree with – that communities typically may generate about 100 ideas for their improvement. Of which some 50+% are self-directed, that is things that a community/residents can do for themselves. Interestingly this echoes research that I & colleagues did in 1996 looking at “Parish appraisals – a spur to local action?” (appraisals were the forerunners of Parish Plans and now Neighbourhood Plans). In which we concluded that community-generated ideas “most readily carried into effect tended to be those whose implementation lay largely in local hands (1996: 326). Furthermore about 53% of actions were “directed at the local community itself (the parish council, community groups, local people in general (p.320). Join forces – don’t reinvent or schism! Several interviews and articles have given me further insights into the asset-based approach to community development – one of the main philosophies I’m reporting in the exploration of community enabling. Here’s a round up, with links to resources at the end. It reinforces earlier insights from our People Powered Change exploration. Last week in Surrey the Lower Green Community Community Association, which is part of the NESTA Neighbourhood Challenge programme, organised an ABCD workshop with Cormac Russell. Jenny French, LGCA secretary, had been impressed by Cormac’s approach at a workshop in Manchester which I reported last year. Cormac gave us some great stories and presentations – including reference to the work in Thornton Heath – and in this interview Jenny explains how the approach has worked in Lower Green. It’s about finding what people need, what others can offer, their aspirations, and then making the connections. In a class to learn English, the teacher asked what people liked to do in their spare time … they said knitting … so this led to the Knit and Natter group where people both learned the language and produced some great knits. These could have been sold, but the group decided to offer them to men in a local hostel as a way of giving back to the community. At the end of the event I asked Cormac if he could summarise the essence of ABCD. He emphasised starting with what you have, welcoming new people into the community, taking a citizen-led rather than professionally-led approach, building relationship power … all things demonstrated very practically in Lower Green. Cormac also said that he felt there was great scope for the various community building and organising approaches to find some common cause. Matthew says that we could do a lot more to share stories in communities by using social media. When I asked what stories he was hearing, in visits around the country, he said that on the one hand people might be pessimistic if they were relying for change on traditional approaches of agency-led development and funding. On the other hand, he found people optimistic and energised when they looked at the strengths they already had in their community … and sought funds only when they could do no more themselves. He said that many community foundations were changing the way that they operated – shifting from administration of national funds, to the development of communities of engaged local philanthropists. Overall this was part of a tide of change, where people recognised a contract between themselves and their community, with rights but some obligation to give back. In a blog post for New Start Magazine, entitled The Big Sobriety, Nick Massey applauds the asset based approach to community development – while warning that funding is also essential. Traditional public sector and foundation-led funding have succeeded only in creating dependency among targeted communities. Providing resources on the basis of need simply underlines the perception that only outside experts can provide real help. Therefore, the relationships that count most for our local residents are no longer those inside the community, those neighbour-to-neighbour links of mutual support and problem solving. Instead, the most important relationships have become those that involve the expert, the local authority, the health provider, the funder. This virtually ensures a cycle of deepening dependency, particularly with funders, as problems must always be worse than last year, or more intractable than the next neighbourhood, if funding is to be renewed. It’s a ‘find it, fund it, fix it’ culture. It’s unsustainable and it’s time to change it… it doesn’t work. Traditional community development is driven through formal meetings, is agency-led and engages with at best 20% of local people in their communities, usually people who work within established, well-organised and properly constituted groups. This leaves over 80% of people remaining on the outside who would never engage in this way. ABCD is about new ways of working that appeal to this wider audience. Three months into community building in Lostock, Manchester we have engaged with 100 local residents whom we had never met before, all now talking about what they can do together. That is ten times more people than we engaged with in the local area partnership there in the last three years. We are already seeing that local people are starting to think about what they can do for themselves. But still while they wouldn’t think twice about raising money for Children in Need or Comic Relief, it remains out of the norm for them to think about raising money for themselves, for their own simple yet exciting ideas. ABCD is about conversations and talents, and we see our role in coordinating these, connecting neighbours and looking with them at future ways of funding their ideas, often from within. This is where our community building team are starting their work. I’ll be gathering resources and interviews about other community enabling approaches. Meanwhile, Tessy Britton has a valuable analysis of participatory paradigms here, leading towards her Creative Collaborative approach. Community Network Builders Convening in Miami – report of two-day workshop with a focus on creating “intentional spaces”. Thanks to Forever Manchester for the link. One of the people we really wanted to come to our DTYE event – on how digital technologies can support young people to engage socially and economically with their communities – was Eugenie Teasley, who set up Spark+Mettle. It is a highly innovative aspirations agency focussed on “preparing young people who do not have the connections or the resources themselves to map and launch a career that they will love”. The young people aren’t participants – they are co-creators of the programme. Unfortunately for us Eugenie was in South Carolina at the time, so on her return we invited her to review the top ten messages from the event in the light of her experience. Here’s a video in which Eugenie explains how the Spark+Mettle Star Track programme blends Benjamin Franklin’s self-improvement programme with an understanding of flourishing as determined by Cambridge University’s Institute of Wellbeing … and then her reflections. I’m really energised by the messages that have emerged from the Young People and Digital Technology exploration project so far. Too often online interaction for young people is either narrowly social or unengagingly pragmatic; I’m thinking Facebook and Blackboard. The digital space is a thriving one—in fact one of the only bustling, growing ecosystems during these economic doldrums. So to encourage fresh approaches to connect young people and technology is something I value and champion. It was in the Young Foundation’s report Plugged in, untapped (2010) that I first came across the phrase ‘digital homophily’—something I’d seen time and time again but not named. There’s this tension about the internet: although it has the capability of being a democratising tool, it is currently not bridging many socio-cultural chasms. In fact—for the most part unwittingly—it has a tendency to widen them. Those who’ve learned how to develop broad networks, to research thoroughly and to engage meaningfully online are in a happy place. But for young people who don’t have extensive networks, the internet is a place to reinforce their offline peer community, and to engage with the brands that influence them. I launched Spark+Mettle a year ago to explore ways to turn this tendency on its head. My aim was to work with young people from tough backgrounds to help them flourish and fulfil their potential. Star Track is a year-long incubator programme that shapes, supports and accelerates the emerging talent in young people. Unlike many similar programmes, the method for the pilot has been to harness digital technology and, working collaboratively with young people, to understand how it can enable them to fulfil their potential. I confess this method came out of practical, personal considerations: I had just had a baby and was ensconced in Brighton, not much able to trundle around the country. But I desperately didn’t wanted the programme to be confined to where I was—the need in Brighton for this sort of programme is considerable, but still considerably less than elsewhere. Going a digital route then seemed to be a wholly practical one—a risk, but one that’s paid off. It’s been great for co-creators: one pair “hangout” each week (as above) when one’s in Essex and the other Edinburgh; we’ve teamed young people in York and Bristol with London counterparts. That’s pretty liberating. The fact that it is not location-based has been a huge plus for our team and volunteers too—people are able to commit to us and to the other logistics of their lives. We’ve had team members dial into their sessions from Singapore and New Zealand. Out of the ten messages that have emerged from the DTYE conversations, there are three that resonate particularly strongly with what we’ve been doing over the last few months. The first is around the concept of blending online and offline. All our co-creators and team members met, in person, during an assessment day in October. That formed a strong basis for the developing online relationships. We have quarterly lunch parlays during which we all meet, and bring in a number of volunteers to connect with our young people on a variety of projects. The most recent one we held was a huge success. The online/offline blend is mutually reinforcing. And in fact, although I appreciate the benefits of game-based approaches, for the group of young people we target (those who have spark and some degree of mettle but lack the connections and resources to get to where they deserve to go) it is the human-to-human interaction (online or offline) that is key. I’m also borderline fanatical about co-design – whether it’s with the users or other providers, a multi-brain mash-up is surely an intuitive approach for generating successful online content and design. We were looking for a title for the young people on our Star Track programme: ‘participants’ was too passive for us. The title ‘co-creators‘ came from them. “As we learn from it, we are also shaping it,” said Suraj Rai. I can’t say it any better. For each session I provide a learning aim, a flourishing theme and a suggested list of questions, discussion points and (online) sources of information. I share these with the agents and co-creators and they are left to adapt the discussion to their particular needs, interests, experiences or aspirations. Beyond the session, there are suggested research and reflective activities, but again these are highly adaptive. They blog their responses which we aggregate on our Tumblr. At every stage the co-creators are feeding back to us about the programme design—what’s working and what isn’t. We adapt accordingly. If it doesn’t work for them, then it doesn’t work. We’re excited to be in a state of flux, and to keep that flexibility integral to our structure, however we grow. The final message that I connect with is around network literacy. It comes back to my earlier point on digital homophily. We shared the Young Foundation’s finding with our co-creators. They agreed with it. Now they’re conscious of it. And our programme deliberately strives not only to reinforce the strong, beneficial peer-to-peer connections but also to help our young people develop the means of connecting with a much wider group, including people from different generations, backgrounds and places. It’s one of the elements of the programme that they enjoy the most and get the most from. What’s key, for me and for the organisation, is that the benefit goes two ways. The UK is shamefully silo-ed. I don’t aim to improve social mobility—not because I like class schisms, quite the opposite. Improved social mobility, to me, means allowing a small number of people to climb the ladder. I’d like to get rid of the ladder. The digital space seems to be the perfect environment to foster a new, non-hierarchical, complex and interwoven society. But it’s not there yet. Getting young people involved in harnessing technology to fulfil their potential is vital to breaking down the hidden social, cultural and economic barriers that prevent them from doing so offline. Spark+Mettle is a small potato, but we’re excited about what we’ve achieved so far, and we’re keen to engage with anyone who has similar aspirations. Together maybe we can really do something.